Russia’s Soviet era was distinguished not by economic growth or human development, but by the use of the economy to build national power. The education of women and better survival rates of children improved opportunities for many citizens, but Soviet Russia was a tough and unequal environment. In the 1980s, the Soviet Union was famously described as “Upper Volta with rockets”.1 This unjustly disparaged the history and culture of the country now known as Burkina Faso. It was also unkind to the Soviet Union, a country that was larger and richer by orders of magnitude. There was a grain of truth, however: the military capabilities of the Soviet Union were disproportionate to its economic size. Figure 1 shows the great powers on a standard measure developed by political scientists to capture ‘the ability of a nation to exercise and resist influence’ in the world. By the 1970s, on that measure, the Soviet Union became the world’s leading power. Yet its economy produced less than half of the real GDP of the US, despite a population of similar size, spread across a much larger territory. Sources: US and world from Angus Maddison at http://www.ggdc.net/maddison; Russia (Russian Empire to 1913, then USSR, followed by former USSR) from Markevich and Harrison (2011). Figure 2 compares the Soviet Union’s economic outcomes in real output per head. In 1913, by global standards, Russia was an average economy – far behind the US, although far ahead of Upper Volta. A century later, at the beginning of the global financial crisis in 2008, Russia was again an average economy. Source: The National Material Capabilities (ver. 4.0) dataset, described by Singer et al (1972), and available at http://www.correlatesofwar.org/ (accessed 7 January 2016). Notes: The composite index of national capability combines six measures of a country’s relative weight in the international system at each point in time: total population, urban population, iron and steel production, energy consumption, military personnel, and military expenditure. Austria-Hungary is omitted, having disappeared in 1918. Much happened in between. The Bolshevik revolution, the centenary of which falls on 7 November 2017, gave way to a Venezuela-style meltdown. After that, the economy recovered, returned to the global mean, and remained above it for some decades. But in hindsight, we can see that the effect of the Soviet system was primarily to lift the level of output by continuous mobilisation. The underlying growth rate of productivity was not lifted, and the Soviet economy never converged on American standards. The Soviet disproportion between power and productivity was a clue. We teach our students that every country has its comparative advantage. The comparative advantage of the Soviet economy lay in the production of the means of power in the world. This reflected the ideas of the leaders who took power in the Bolshevik revolution, in the policies they implemented and in the institutions they laid down (Harrison 2017a). • The German model was of a modern war economy, implemented in 1915 and 1916 by Walther Rathenau and Erich Ludendorff. In the war economy, there was mobilisation for mass warfare and mass sacrifice, with commodities rationed at fixed prices. • The American model, implemented by Henry Ford and celebrated by Frederick Winslow Taylor, was of standardised commodities, mass-produced under centralised, hierarchical management. Together, these two models provided key principles of the ‘Soviet-type economy’ described in western textbooks. Soviet economic institutions were formed in the period from 1917 to around 1934 (Davies 1994). These years were marked by intense political and social conflict and several U-turns that varied the scope for market organisation and consumer choice. The U-turns give some credence to the idea that the Soviet economy could have developed along more than one alternative path. Even today, after all, ‘varieties of communism’ persist – from China and Cuba to North Korea. Despite the variation, there were important continuities in Soviet policies after 1917. Most obvious was centralised single-party dictatorship. The dictators shared beliefs that formed their perceived self-interest and how best to promote it. They saw the world as intrinsically hostile, and their country as a fortress besieged by enemies and penetrated by spies. When not at war, they prepared for war. In the economy, they built the capacity of an authoritarian state to select and direct personnel, to protect its supply chains and to channel and filter information. This was a unilinear process that began in 1917 and continued in the background, regardless of policy fluctuations (Harrison 2017b). Beyond the borders, the Soviet rulers subverted neighbouring states, eventually imposing communist regimes on most of them. Having secured their neighbours as allies, they invaded them more than once under the banner of ‘defending the gains of the revolution’. Their confrontational actions continually generated evidence that would serve to validate their beliefs. In the domestic economy, Soviet policies profoundly changed the allocation of resources, repressing consumption to finance industrial and military projects. One result was a vast military industry, organised for the mass production of armaments. In traditional branches, as Figure 3 suggests, this complex was largely laid down in the 1930s. When WWII broke out, the Soviet Union already rivalled Germany as one of the world’s two leading suppliers of weapons (Davies et al. in preparation). New branches for nuclear weapons, space missiles and radio electronics were added during and after the war. Source: Dexter and Rodionov (2017). The Soviet state confiscated most personal wealth and appears to have distributed wage incomes from employment more equally than in Russia before or since. This is suggested by Figure 4, which shows new data from Novokmet et al. (2017). But income data might not be a good guide to consumption inequality under communism. The distribution of consumer goods and services was characterised by shortage and privilege. 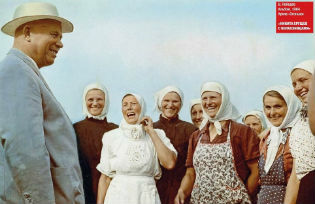 Every Soviet adult could count on an income, but income did not decide access to goods and services – that depended on political and social status. The once-familiar images of queues outside Soviet stores depict the people who had money but were unable to spend it without waiting because they lacked the privilege or the contacts required to do so. Source: Novokmet et al. (2017). Note that in Soviet times, the share of income not distributed to adults was much greater than before or after. Personal income data are based primarily on the distribution of wage earnings, which excludes most rural households. Under the Soviet system, millions of lives were damaged or destroyed by periodic famines, episodes of mass killing, and continual, pervasive repression. Meanwhile, under the same system, millions of other lives were advanced. The beneficiaries are identified most easily in demographic terms. One group that gained was young women. The Bolsheviks, who aimed to promote national capabilities, saw women as a potential resource, but shackled by illiteracy and lack of education. Mass education opened the world of office work to women, released them from drudgery in fields and factories and enabled them to live respectable lives. For example, by 1970, women accounted for more than 60% of all employees in government and business administration (TsSU 1973: 348, 445). In their careers, women continued to encounter job segregation, a glass ceiling and the ‘double shift’ of paid work and work in the home. Still, the change in their lives was profound. A second group of beneficiaries was children. Before the revolution, one in six children died before the age of five years. After worsening in the troubled early years of Soviet rule, this proportion improved dramatically. The main factors were simple but forceful measures for public sanitation, infection control, and antisepsis in childbirth and surgery. As Figure 5 shows, by the 1950s, life expectancy at birth had risen from under 30 years to more than 60. After that, improvement stopped and for a time it even went into reverse. Source: Goskomstat Rossii 1998: 167-168. Figure 5 also suggests a third group, one that made no gains. These were men (and women) of middle age. The Soviet Union made little use of the new science of non-infectious and degenerative diseases. Mature Soviet citizens smoked, drank immoderately, breathed dirty air and died prematurely of organ failures and cancers. From the 1890s to the 1980s, the life expectancy of men and women aged 40 and above barely changed. The Soviet economy was a product of global wars and of the beliefs and technologies of the early twentieth century. During its lifetime, many other countries made similar or greater social and economic gains with more consent and less violence. On its centenary, the Soviet economy should be remembered but not mourned. Davies, R W (1994), “Changing Economic Systems: An Overview.” in R W Davies, M Harrison and S G Wheatcroft (eds), The Economic Transformation of the Soviet Union, 1913-1945, Cambridge: Cambridge University Press, pp. 1-23. Davies, R W, M Harrison, O Khlevniuk, and S G Wheatcroft (in preparation), The Industrialisation of Soviet Russia, vol. 7. The Soviet Economy and the Approach of War, 1937-1939. Basingstoke: Palgrave. Dexter, K, and I Rodionov (2017), “The Factories, Research and Design Establishments of the Soviet Defence Industry: A Guide: Ver. 18”, University of Warwick, Department of Economics. Goskomstat Rossii (1997), Naselenie Rossii za 100 let (1897-1997). Statisticheskii sbornik, Moscow. Harrison, M (2017a), “The Soviet Economy, 1917-1991: Its Life and Afterlife,” The Independent Review 22(2): 199-206. Harrison, M (2017b), “Foundations of the Soviet Command Economy, 1917 to 1941,” in S Pons and S Smith (eds), The Cambridge History of Communism, vol. 1: World Revolution and Socialism in One Country, Cambridge: Cambridge University Press, pp. 327-347. Markevich, A, and M Harrison (2011), “Great War, Civil War, and Recovery: Russia’s National Income, 1913 to 1928”, Journal of Economic History 71(3): 672-703. Novokmet, F, T Piketty, and G Zucman (2017), “From Soviets to Oligarchs: Inequality and Property in Russia, 1905-2016”, WID.world working paper no. 2017/09. Singer, J D, S Bremer, and J Stuckey (1972), “Capability Distribution, Uncertainty, and Major Power War, 1820-1965”, in B Russett (ed. ), Peace, War, and Numbers, Beverly Hills: Sage, pp. 19-48. TsSU (1972), Narodnoe khoziaistvo SSSR. 1922-1972. Iubileinyi statisticheskii sbornik. Moscow: Statistika. [1 The phrase was coined in 1987, apparently, by Xan Smiley, then Moscow correspondent of The Daily Telegraph; see http://www.russialist.org/archives/3059.html##6 (accessed on 28 September 2017). Mark Harrison is Professor of Economics at the University of Warwick and a Research Fellow of Warwick’s Centre on Competitive Advantage in the Global Economy, the Hoover Institution, Stanford University, and the Centre for Russian and East European Studies, University of Birmingham. He was one of the first western economists to work in Russian archives after the collapse of the Soviet Union. He has published in the Economic History Review, European Review of Economic History, Journal of Comparative Economics, Journal of Economic History, Journal of Economic Literature, and other journals. His recent books include Guns and Rubles: the Defense Industry in the Stalinist State (2008), The Economics of World War I (2005) and The Economics of World War II (1998). He is currently working on the political economy of secrecy and security.